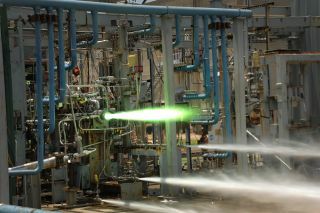 A 3D-printed rocket engine injector undergoes hot-fire testing at NASA's Marshall Space Flight Center in Alabama, during which it was exposed to temperatures of nearly 6,000 degrees Fahrenheit. Key rocket parts built using 3D-printing technology have passed another round of NASA firing tests, inspiring further confidence among space agency officials in this emerging manufacturing technique. Two rocket engine injectors made with a 3D printer performed as well as traditionally constructed parts during recent hot-fire tests, which exposed them to temperatures approaching 6,000 degrees Fahrenheit (3,316 degrees Celsius) and extreme pressures, NASA officials announced Wednesday (July 24). The testing regime is helping NASA assess the potential of 3D printing, also known as additive manufacturing, to make space exploration cheaper and more efficient. "Rocket engines are complex, with hundreds of individual components that many suppliers typically build and assemble, so testing an engine component built with a new process helps verify that it might be an affordable way to make future rockets," Chris Singer, director of Marshall's engineering directorate, said in a statement. "The additive manufacturing process has the potential to reduce the time and cost associated with making complex parts by an order of magnitude," Singer said. The Marshall team built the 3D-printed engine injectors onsite (in contrast to the parts used in the Glenn tests, which Florida-based firm Aerojet Rocketdyne constructed) and put them through 11 hot-fire tests, accumulating 46 seconds of total burn time. The parts did well during the trials and emerged in excellent condition, NASA officials said. The injectors' performance was identical to that of traditionally manufactured parts already tested during the development of NASA's Space Launch System rocket (SLS), a heavy lifter designed to blast astronauts toward near-Earth asteroids, Mars and other destinations in deep space, officials said. The traditionally constructed injectors used in the SLS tests cost about $10,000 each and took six months to build. The 3D-printed versions, by contrast, cost less than $5,000 and reached the test stand in a matter of weeks. Left: 3-D printed rocket injector as it looked immediately after it was removed from the laser melting printer. Right: Injector after inspection and polishing. "It took about 40 hours from start to finish to make each injector using a 3D-printing process called selective laser melting, and another couple of weeks to polish and inspect the parts," Marshall materials engineer Ken Cooper said in a statement. NASA apparently sees great promise in 3D-printing technology. For example, the space agency is teaming with the California company Made in Space to launch a 3D printer to the International Space Station next year. And NASA recently funded the development of a prototype "3D pizza printer" that could help feed astronauts on long voyages through deep space. "At NASA, we recognize ground-based and in-space additive manufacturing offer the potential for new mission opportunities, whether printing rocket parts, tools or entire spacecraft," Singer said. "Additive manufacturing will improve affordability from design-and-development to flight-and-operations, enabling every aspect of sustainable, long-term human space exploration."